While doctors say the Nintendo 3DS won't melt children's eyes (and is possibly beneficial! ), Nintendo is standing by its warning about the upcoming 3D-glasses-free portable gaming device. In late December, Nintendo issued a warning about the 3DS, stating that children under the age of six would not be allowed to enjoy the 3DS's 3D function at its recent Nintendo World event in Japan. "We are being proactive about informing our customer, even though it may not necessarily be positive for our sales," Nintendo president Satoru Iwata told The Wall Street Journal. As Nintendo pointed out in December, the vision of young children is still in its developmental stages, which is why it recommends that kids do not use the 3DS's 3D effects. There are similar recommendations for 3D movies and 3D television. Up until now, Nintendo recommended a break after an hour of play. But that was 2D, and as Nintendo notes, 3D causes quicker eye fatigue and some 3D software causes eyes to become more tired faster than other software. But in the case in which players are able to enjoy 3DS games problem free, Nintendo recommends taking a break after 30 minutes of play. "If your physical condition worsens or you become ill, please stop playing at once," Nintendo stated in an official release. Nintendo is going as far as to include 3D parental controls for the Nintendo 3DS as well as warnings in the instruction manual and the packaging itself. According to Nintendo, "Since the Nintendo 3DS can be changed to 2D to avoid any effects on young children's vision, it is possible for anyone to enjoy playing it." Nintendo president Satoru Iwata stressed to the Wall Street Journal that Nintendo doesn't view the 3DS as a dangerous and tells the paper that the warning came as a result of discussions with a specialists regarding the product and effects on children. 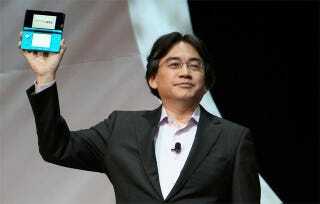 "Parents sometimes use video games almost as a babysitter for their kids," Iwata said. Thus, kids might be exposed to 3D for long stretches of time. These warnings and this handholding isn't just Nintendo looking out for players, but looking out for itself. Iwata did not deny that legal action was a reason for the warnings — though, he stated it was not the main reason. It's just a matter of time before the inevitable chowderhead tries to sue for pain and suffering incurred by general stupidity and greed.